If you are a true water sports lover, we have the perfect tour for you right here! 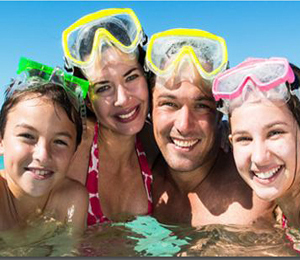 Our Paradise Ocean Do-It-All Package is the ultimate in water activities and offers something for each member of the family. Our 72- foot double decked catamaran is ready to take you on the cruise of your lifetime! During the basic package tour, check out the fascinating history that lingers in the harbor of Nassau as we take you sightseeing. We will also take you on a snorkeling adventure to explore a coral reef full of marine life and beauty. When it's time to relax, a delicious Bahamas-style lunch will be served and you will have time to kick back on a beautiful beach. Besides all the exciting activities that come with the basic package, the full package includes the opportunity to go on a fun banana boat ride. If you like it a little faster, hop on a Jet Boat or Jet Ski and race across the water with your friends! And with this package, one of the greatest adventures awaits you: let us lift you into the air with a parasail! We promise you will never forget the amazing view of Paradise Island and surrounding waters. This is such a perfect area for water activities and this is the perfect opportunity to try out several during only one tour. What activities are included in the Do It All? The activities included are snorkeling, jet skiing, parasailing and a banana boat ride. Approximately how long is each activity? I have been to the Bahamas many times, but Bahamas Ocean Do-It-All Package is one of my favorite trips! It includes everything that everyone should do here. As a Bahamas veteran, I can say only the best about this experience!